Mrs. Smith: Finally an Upper East Side Socialite Who Can Shred! 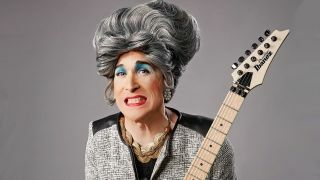 “Paul Gilbert, except it’s your grandma.” Mrs. Smith discusses her meteoric rise to fame over the last few years. When America’s next guitar savior takes the stage, she won’t be wearing leather pants, Spandex and flowing long hair. Instead, she’ll be a socialite from Manhattan’s Upper East Side who rocks her chain of pearls just as hard as she rocks her Ibanez JEM77 (“It has a handle on it like a purse!” she says) and answers the age-old question: What if Dame Edna and Yngwie Malmsteen had a child who was then raised in high society? Mrs. Smith, a cat-obsessed lady of a certain age, is the alter-ego of actor/musician David Hanbury. The commitment to the ruse is no small thing — Smith has become a regular sight in New York City, where her high-energy busking performances, concerts and off-Broadway shows have made her a local legend. With her debut album, Introducing Mrs. Smith, she finger-taps all over songs dedicated to her beloved feline companions and public-television icon Bob Ross. It’s a suitably strange step in a guitar career that started in the Nineties, when Mrs. Smith was kidnapped by a Norwegian metal band, for whom she eventually assumed lead guitar duties after the original ax-man self-immolated (in Mrs. Smith’s appropriately loony lore, the group would go on to win the Eurovision Song Contest). Metal is no stranger to larger-than-life characters, which is perhaps why Mrs. Smith has been warmly welcomed by the community, with no less than Steve Vai counting himself as a fan. Of course, not everyone has been thrilled at being upstaged by a lady who lunches and sports a beehive hairdo and cat-print guitar. It’s been a meteoric rise for Mrs. Smith over the past few years — she’s appeared in an honest-to-goodness Gucci Eyewear ad and gained national notoriety, thanks to an appearance on America’s Got Talent. With her wickedly fast fingers, prim-and-proper adherence to etiquette and a stage presence that can best be described as “Paul Gilbert, except it’s your grandma,” she might be the best hope for a mainstream shred revival. That is, if being a rock star wasn’t so exhausting, darling. “I want to collapse! I want to get a whole new apartment and call it ‘The Collapse’ and fill it with pillows and jump into the pillows and scream and sleep for 10 years,” she says.